Free tours run for approximately 40 minutes and are provided Wednesday to Sunday. Free exhibition talks and tours. For daily listings, check our events calendar. View the April 2019 program. Highlights tour of our Welcome Garden, historic Commissariat Complex and the Bond Store exhibitions. Highlights tour of the treasures of the Central and Henry Hunter galleries. Guided tours for clubs, tourist groups or other organisations please click here. Go on a theatrical journey through TMAG's buildings, which are the earliest still existing from the first European settlement of Hobart. Run by AntipoDean Entertainment, the tours take place from Wednesday - Friday at 11:30 am and 2:00 pm, and tickets cost $20 adults, $15 children, $60 families (2 adults, 4 children) and under 4s are free. For more information and to check availability and book, visit the Settlement Secrets website. The Tasmanian Museum and Art Gallery is proud to host an ongoing series of free evening and lunchtime talks and lectures to enhance your intellectual life, spark your curiosity and enliven your mind. These are presented on-site at TMAG by a range of leading organisations. 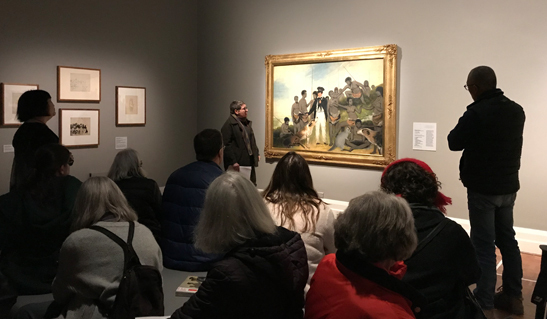 View the April 2019 Talks at TMAG program. For further information about TMAG events, follow our social media accounts on Facebook, Twitter and Instagram. For more great arts experiences in and around Hobart, visit the Tasmanian Arts Guide. This page was last modified on 18th April 2019.